We’ve been on the road about half an hour when Google Maps catches up to the discreet sign on the roadside. A narrow sandy road takes us off the highway and weaves us towards the coast; spiny cacti puncture the landscape. We roll pass coconut palms with cows grazing underneath and fields of papaya trees hanging heavy with the fleshy fruit. In the distance, a line of palapa roofs rise above the shimmer of the horizon and my anticipation builds for the 24 hours to come. 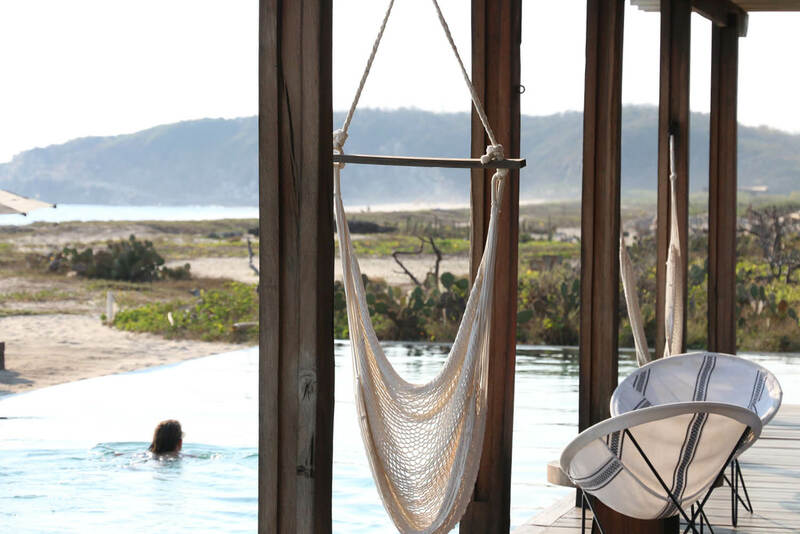 On this virgin stretch of Mexico’s Pacific Coast, Hotel Escondido is the palm-thatched hideaway you never knew existed. Here, 16 bungalows sit side by side within the gnarled and seemingly hostile vegetation; paths passing by eight-foot cacti. This is a place to kick your shoes off on arrival and leave them off. 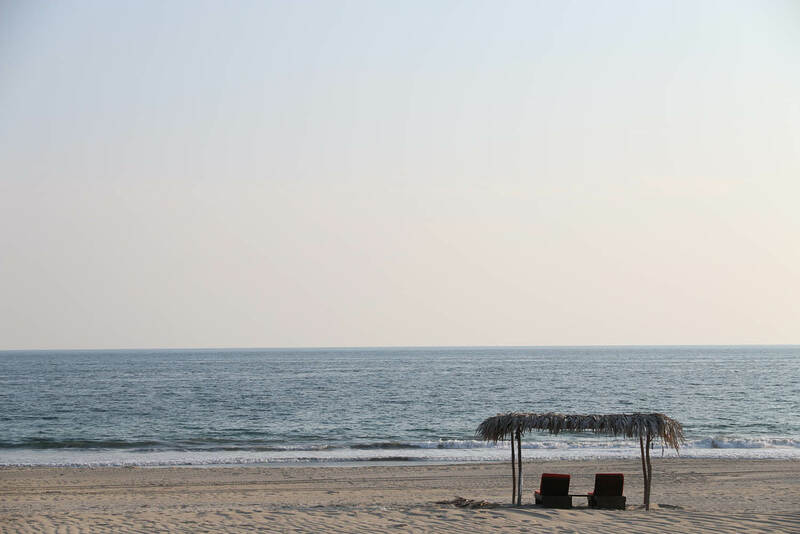 We’ve been staying in nearby Puerto Escondido, an under-the-radar magnet for Canadian retirees and surfers in equal measure, who are drawn to its laid-back living and bombastic barrels that separate the men from the meek at Zicatela; Mexico’s pipeline. But here, I feel as though we’re on some far-flung island. A secret design-lover’s retreat, it’s part of the Design Hotels family. In our room, cross ventilation and aesthetic flow meet in the middle with sliding shuttered doors on both sides and a king bed as its centrepiece. From the bed, it’s just a few short steps to an oceanfront concrete plunge pool framed by coral sunloungers and a light blue hammock for two. Materials are raw, natural and harmonious with the setting. Beautiful wide floorboards bleed into a solid timber bedhead and the bed appears to be floating. Wooden louvres send light and shadow dancing across the long wooden bathroom vanity, crowned with thick, rectangular concrete basins. Setting down smoky mezcal margaritas at the beachfront bar once we’ve settled in, waiter Aris tells me the hotel was built around four years ago, “but we say it’s still a baby because it hasn’t gone through a hurricane”. Architecturally impressive neighbour, Casa Wabi, was here first but apart from the artist residency, and a private home being built on the opposite side of the hotel, this stretch of beach is all ours. At least for the night. “We normally serve our guacamole with the grasshoppers on top, do you want them?” Aris asks. Grateful that we’re still cemented in Oaxaca with its UNESCO-listed food culture, not an isolated hotel with Americanised food trends, it would be rude to say no. The added lime and chilli crunch gives a new dimension to an already cracking Mexican staple. If we were relaxed in Puerto Escondido we’re practically catatonic here. I sip my margarita while sitting in a hammock chair, toes drawing lazy circles in the lap pool, eavesdropping on the couple at the other end of the bar, trying to single out what meagre Spanish words I know. After watching the sun perform its nightly dive, and taking full advantage of our private plunge pool, I pick up the wooden torch from the nightstand and we pad along the beachfront to the open-sided dining room. 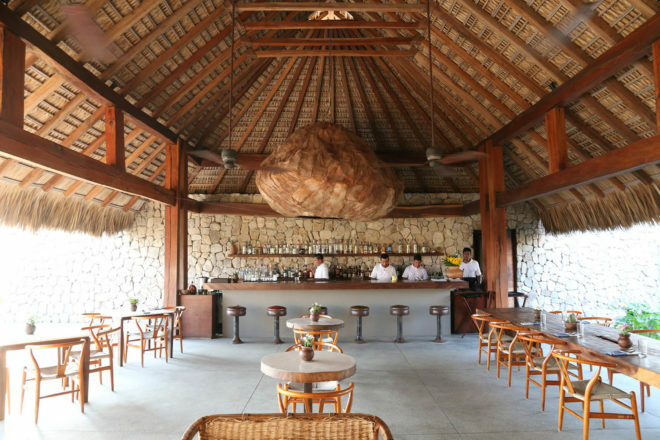 Above us, a huge pendant light shade is stitched together from banana leaves, hanging from the soaring palapa roof. There’s a set menu each evening for the small cluster of 32 guests, with dishes dictated by the freshest produce to take the fancy of the chef. Food is served in organic terracotta bowls and platters, fashioned by the hands of the locals of Nopala – a small village in the mountains nearby. Smoky gazpacho is poured from a chunky teapot over lobster tail pulled from the sea by local fishermen, then, fresh snapper, grilled over the coals is presented with a mound of watercress on a thick oversized platter. Fruit flan for dessert is washed down with a rosé from Guadalajara. The next morning, a warm morning glow lights up the inside peak of our roof as the wooden fan pirouettes overhead. I feel pangs of envy at breakfast watching other guests pick at the buffet knowing they have more mornings ahead to try it all. There’s also the matter of the spa and apparently, a secret underground club I haven’t had the chance to find. All the more reason to visit again, I decide. Fly to Puerto Escondido via Mexico City with VivaAerobus, Interjet or Aeromar. Alternatively, you can fly to Huatulco, one-and-a-half hours south of Puerto Escondido, which is serviced by Air Canada and larger US airlines. We hired a car in Puerto Escondido for the 30-minute drive but transfers can be arranged via the hotel. A new highway linking Oaxaca City with Puerto Escondido – pipped to cut travel time from eight hours to two – is due to open in 2018. But with stalled construction and ongoing financial strife, the feeling from locals is it could still be a long time coming. Rooms at the adults-only Hotel Escondido start at $336 per night. To book, go to designhotels.com. Tours of artist residency, Casa Wabi, which was created in 2014 by Mexican artist, Bosco Sodi, and designed by Japanese architect Tadao Ando, are available three times per week. Bookings can be made at reception at Hotel Escondido. The name is a twist on the Japanese concept of ‘wabi sabi’, which means the art of finding beauty in imperfection. Don’t leave without contemplating the meaning of life for a few minutes in the meditation observatory.